I'm in love with pumpkin. It's no secret. I've had plenty of dinner dates with pumpkin over the past couple of years, and even a number of lunch dates too. In fact, pumpkin even snuck it's way into my breakfast today, in the form of 'pumpkin pie porridge.' Now that was a good start to the day. Actually, if I'm honest, I've been enjoying a lot of pumpkin lately. The more I have, the more I want. Despite the fact I had pumpkin in my breakfast and lunch today, I yearned for it's sweet, delicious and comforting characteristics again for dinner. Some may say this is pumpkin overload (that includes a work colleague who recently told me I looked jaundiced....) but I say this is a healthy, seasonal fling. You see, pumpkin is both sweet but savoury, uplifting but grounding, comforting but exciting, and ever so versatile. I know I can rely on pumpkin; it is a trustworthy staple that is available all year round, and thus can always be found in my fridge or just chilling on the outdoor setting in the cool winter air. As well as tantalising my tastebuds, pumpkin also nourishes my body in many ways. Pumpkin is a wonderful source of fibre and thus fills my belly without a significant kilojoule intake. It's also a wonderful source of vitamin C and beta carotene (which our bodies can convert into Vitamin A); these nutrients boost our immune system, keep us well during the cooler months and can even reduce our risk of developing certain cancers. These nutrients also promote healthy glowing skin and good eyesight. As if that wasn't enough, pumpkin also provides iron, folate, magnesium and calcium, making it a very nutrient dense food indeed. With this impressive nutrient profile in mind and a strong hankering for yet more pumpkin today, I got to work in the kitchen tonight and whipped up this delicious, comforting and satisfying soup. 1kg pumpkin (I used a Jarrahdale variety, but any type of pumpkin could be used). 1. Dice the onion, crush the garlic, and set both aside. 2. Peel the pumpkin, sweet potato and carrots, and chop into small cubes. 3. In a large saucepan or soup pot, heat the oil over medium heat. Add the onion and garlic and sautee until onion is translucent. 4. Add the cracked pepper, Chinese five spice powder and chilli flakes and stir until combined. 5. Add the chopped pumpkin, sweet potato and carrot and stir until coated in spice mixture. Add the 2 cups of vegetables stock and stir to combine. Cover with a lid and allow to simmer over low-medium heat for about 30 minutes or until all ingredients and soft. 6. Add the can of drained and rinsed butter beans and 1/2 cup of yoghurt and stir well to combine. Leave to simmer for a further 10 minutes. 7. Remove saucepan from heat and blend well using a hand held stick blender until smooth and creamy and free from lumps. *Note - you may wish to add an extra 1-1.5 cups of water at this point, depending on how thick you like your soup. 8. Spoon into bowls and top with a dollop of extra plain yoghurt, chopped fresh coriander and black pepper to taste. Serve with seeded sourdough bread and enjoy! 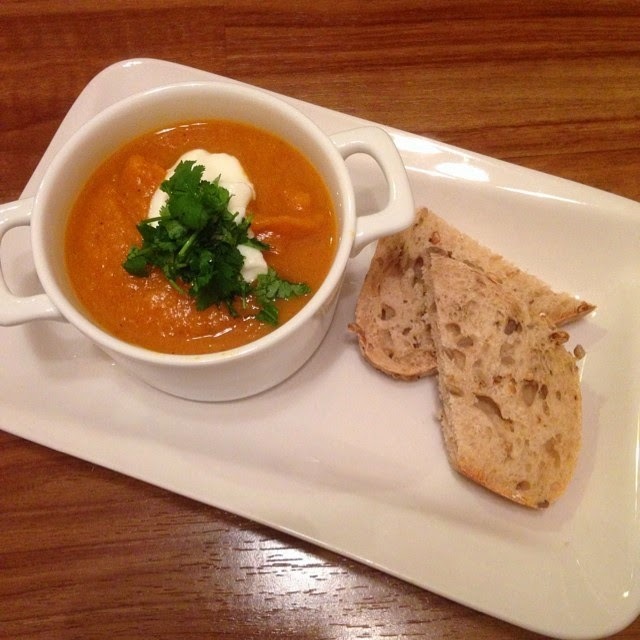 Spiced pumpkin, carrot and sweet potato soup. Perfect on a cold winter night. I hope you will enjoy this soup as much as I did. Please leave a message below if you do try this recipe or if you have your own special pumpkin soup recipe to share. Don't 'beef up' this winter, veg up instead! Veggies: Do you get your 5 serves a day? ?